JERUSALEM—Greece’s foreign minister Nikos Kotzias arrived in Israel Tuesday to strengthen bilateral relations, where he will reportedly receive tips on how the neighboring country climbed out of the financial depths to achieve international economic success. 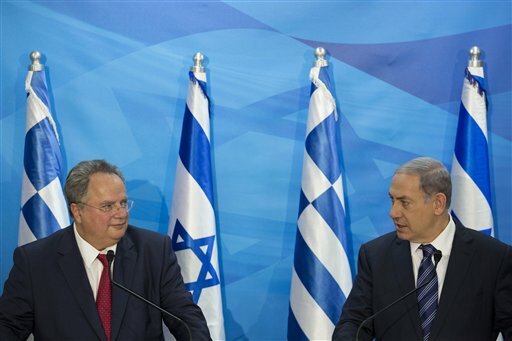 Israel and Greece have strengthened ties in recent years as a counter-balance to Turkey's influence in the region. Israel, Greece, and the United States hold annual military exercises together. Kotzias was received by Prime Minister Benjamin Netanyahu, who praised him for going ahead with his visit despite the crisis that has overtaken his country. Netanyahu said Israel was "committed to help in any way we can to ensure your success." The Greek minister will reportedly meet with Eugene Kandel, the outgoing chairman of Israel’s National Economic Council, who briefed the cabinet in Jerusalem Sunday on how Israel managed to avoid the pitfalls that have ensnared Greece. Kandel said that a decade ago, Greece’s GDP per capita, $25,837, was higher than Israel’s, $21,796. The Greek figure has been static, while Israel’s has grown 50 percent, to $32.691. Israel has cut its public sector—in a marked distinction from Greece’s public sector—which reduced debt and encouraged foreign investments, Kandel said. "Long-term fiscal credibility is a critical component of any economy," Kandel told the ministers. Among the foreign investors in Israel are large multinational corporations that have played an important role in Israel’s emergence as a world tech center and start-up pioneer. One of the companies, Intel, has created 30,000 jobs in the country. Some 300 international giants have R&D centers in Israel, channeling billions of dollars into the economy and giving scope to young engineering and scientific talent. While unemployment in Greece rose from 8.4 percent in 2002 to 26.5 percent in 2014, it declined in Israel during that period from 12.8 percent to 5.9 percent. Israel’s economic low point was in 1985 when it suffered 500 percent inflation and was mired in debt. Under then-Prime Minister Shimon Peres, the government forced through a draconian program that included far-reaching cuts in the public sector, devaluation of the shekel, and opening the country to foreign investors. The economy stabilized in a relatively short period. Greece, of course, has been tied to the Euro since 2002 and has no national currency to devalue. Kandel said many of Greece’s problems are due to strong unions, which forced a succession of governments to adopt gratuitous social benefits, such as full retirement pension at age 57. Unwilling to cut its budgets, Athens borrowed to fund its ever-growing obligations and in time could no longer repay its debt. Foreign investments fell to near zero, and Greece has been shut out of the bond markets since 2012, Kandel said. Athens has been making great efforts to protect its tourist industry, Greece’s primary income earner. There is little direct trade between the two countries, so Israel will not be buffeted by Greece’s current situation, Kandel said. This entry was posted in Issues and tagged Financial Crisis, Greece, Israel. Bookmark the permalink.